Here is a bullet list of the most important variables in bluff stability. Height. The higher the bluff, the more likely its weight will cause movement or slippage. Sediment type. The finer the sediment, the greater the risk. Muddy clay and silt are the most unstable materials. Mud is structurally weak and prone to slow-motion creep, moderate slumping, or sometimes large landslides. Slope. The steeper the slope, the easier it is for gravity to initiate a landslide. Slope Aspect. South-facing slopes undergo more extensive freeze and thaw cycles in winter months than slopes that face other directions. Repeated freeze-thaw cycles increase the likelihood of shallow soil slumps. Topography. Swales, gullies, or ditches can direct surface water toward or away from the bluff face and slope. They also affect the recharge of sub-surface water and groundwater. Vegetation. 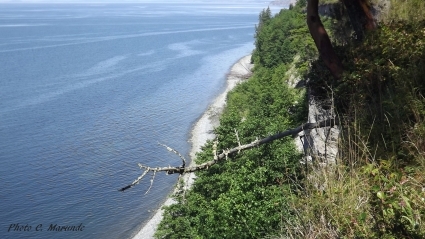 The type, age, health, and abundance of vegetation growing on a bluff can offer valuable clues to determine slope stability. Even the presence of stumps and fallen trees can tell a story to a knowledgeable observer. Waves, Tides, and Sea Level. Tides wash away eroded bluff sediment, which helps wave action move inland. Storm-driven wind, waves, and flooding can cause more extreme erosion at the base of a bluff, increase the bluff slope, and make a landslide more likely. Drainage. Water can be the most common factor that causes bluff instability, either from groundwater seepage within a bluff, or surface runoff on the bluff itself. Surface water. Wetlands, ponds, and streams above the bluff can supply water to the bluff face and also to the ground water. Ground water. Ground water comes from surface sources, such as rain or a stream, uphill in the local watershed. Ground water tends to flow horizontally beneath the surface and may seep out the face of a bluff. Seeps and springs on the bluff face contribute to surface water flow and destabilize the bluff face. Earthquakes. Landslides can be triggered by earthquakes. Ground vibration loosens sediment enough to reduce the strength of material supporting a bluff and a landslide results. Land Use. Human actions can enhance or reduce the risk of a landslide. Actions that increase surface water flow to a bluff face, such as watering lawns or grading slopes, add to natural processes destabilizing the bluff face. Surface water, collected by roofs, driveways, paths, and lawns flows toward and down the bluff face. Walkways down the face of a bluff can lead to greater erosion from foot traffic or the concentration of surface water flow. Clearing of vegetation from the bluff face can lead to greater bluff erosion and a steeper bluff that is more prone to landslide. Vegetation tends to remove ground water, strengthen soil with roots, and lessen the impact of heavy rain on the bluff face. The Spit on which the Dungeness Lighthouse is located is a point of demarcation for wind, waves, and bluff stability. West of the spit gets more wave activity and more wind, especially in storms, than some of the bays and protected areas to the east of the spit. The last thing you want to do is buy a home on a beautiful bluff and in 10 years, your home is condemned because it is too close to the bluff after substantial landslides. We are very fortunate to have fairly stable bluffs, and I recently sold a gorgeous home on 170 foot bluff with a stunning panoramic water view. But do your homework. I do recommend careful consideration when you are looking at bluff property. 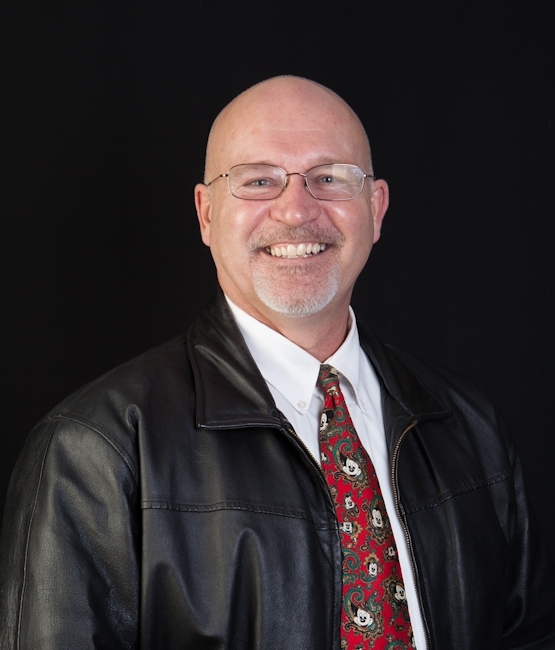 I would also recommend that you have a Realtor who understands the issues and can give you guidance so you can know where to find the answers and how to make wise decisions about bluff stability. 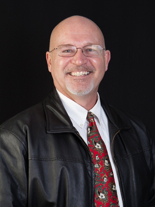 One Response for "Buying a Home on a Bluff and Bluff Stability"
You ought to take part in a contest for one of the best real estate sites online. Well written articles and full of good information. Love Sequim and also love west of Port Angeles. 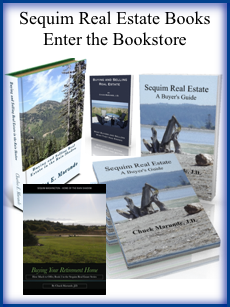 Please keep up the articles about Sequim real estate, because we read you blog several times a week.